To Fit2Finish, Wendy Rilling LeBolt brings 23 years of soccer parenting, 15 years of soccer coaching, advanced degrees in exercise physiology and 10 years of college teaching in exercise and sport science. All of this is layered over a lifetime of sports and fitness which is the language she speaks through Fit2Finish, the company she founded in 2001 and where, for nearly a decade and a half, she has trained thousands of young athletes and teams. Wendy has published hundreds of articles and columns on topics related to health, wellness, fitness and sports performance. She writes weekly for the Kicking Fit blog on Soccerwire.com and posts regularly to her inspirational blog, The Kinesthetic Christian. Wendy did her undergraduate work in biology at The College of William and Mary, earned her Masters degree in Exercise Science from The George Washington University and was awarded her PhD in Physiology from the Medical College of Virginia. While on the Exercise Science faculty at George Washington University, she taught anatomy and physiology, exercise physiology and kinesiology and built a reputation as a popular speaker at corporate and educational health and fitness events. The mother of three daughters, she moved from teaching to coaching and training when she founded Fit2Finish in 2001. Dr. LeBolt has been coaching rec and travel soccer since 1996. 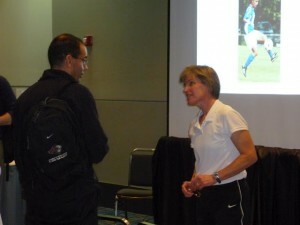 She holds the E and F soccer coaching licenses through US Youth Soccer. Growing up, she participated in a menagerie of sports including youth soccer, high school golf, tennis, swimming, and softball. She competed on the College of William and Mary women’s golf team for four years. They were Division III National Champions and have been inducted into the William and Mary Athletic Hall of Fame.